In 1956, Sherry Lee recorded her first single on Mar-Vel Records based in Hammond, Indiana. On the Mar-Vel label, their singles bore the motto: “Hits of Tomorrow Recorded Today.” Mar-Vel Records had her billed as “Sixteen year old Miss Country Music” on the label credits. Lee was described as a confident young girl with a clear, warm voice. The single, “Baby Honey,” featured Sherry Lee attempting a fast paced country waltz with ringing steel guitar behind that got out of synch with the rhythm with each successive verse. Next, Myers was billed as Jackie Dee. Billboard wrote in their June 10, 1957, issue that Sherry Lee Myers is a “16-year old C&W singer of Batavia, Illinois.” Music writer Bill Sachs reported that Myers had been “recently signed as a rockabilly artist by George Goldner’s Gone Records in New York, out of the Gale Agency in the Big Town.” Her managers, Irving Schacht and Paul Kallett, had changed her name to Jackie Dee. Her single for Gone Records was “I’ll Be True”, a 1953 R&B hit for Faye Adams, and “How Wrong I Was”. With her single release, Jackie Dee appeared at the Uptown Theater, Philadelphia on 3rd July 1957, and at the Paramount in Brooklyn, New York, with Alan Freed’s Big Rock’n’ roll Show in mid-July. Then, in 1958, Jackie Dee recorded two songs she wrote in Nashville. The “Strolypso Dance” was a tune that borrowed from both Brenda Lee and Paul Anka in vocal style. The song was set to a beat that could be danced to either The Stroll or Calypso. The other tune, “Buddy,” imitated Brenda Lee and got Jackie Dee some attention on a few radio stations. After Liberty Records released this single, Jackie Dee switched to Fraternity Records to release “Just Another Lie”. But this time she the song was credited to Jackie Shannon and The Cajuns. Then in 1959, Jackie Shannon released “Trouble“, a song featured in the Elvis Presley film King Creole. This time she appeared on the PJ label. Several more releases in 1959 appeared on Edison International under the billing of Jackie DeShannon. After one more single release with this label, she switched back to Liberty Records. In 1961, she moved to Hollywood. From 1960 to 1964, Jackie DeShannon released 15 singles with Liberty. A couple of these, including “Needles And Pins” and “When You Walk In The Room” made the Billboard Hot 100 at #84 and #99 respectively. In Vancouver, the former song charted to #8 and the latter to #21. In 1964, she appeared in a surfing movie with Bobby Vinton titled Surf Party. In February 1964, Jackie DeShannon formed party of a touring band with Ry Cooder to open for The Beatles North American tour that included 26 concerts. That same year she wrote “Come And Stay With Me”, a hit for Marianne Faithfull. In 1965, Jackie DeShannon switched labels again and had a Top Ten hit in the USA with “What The World Needs Now Is Love”. The song climbed to #6 on CKLG in Vancouver. 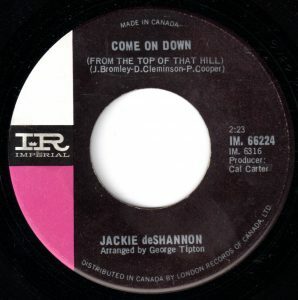 While the sales from the single were auspicious, Jackie DeShannon wouldn’t crack the Top 60 again until 1969. Over the next few years she had little success with her commercial releases. One of these,”Come On Down (From The Top Of That Hill)”, stalled beneath the Billboard Hot 100 at #121. But in Vancouver, the tune reached #13. “Come On Down (From The Top Of That Hill)” is a song arranged by George Tipton. He was a composer of multiple themes for TV shows. Among his TV themes were The Love Boat, The Golden Girls, The Courtship of Eddie’s Father, Soap, Benson, The Empty Nest, It’s a Living and others. Tipton also arranged songs for numbers of recording artists. These include for “Everybody’s Talking'” by Nilsson, “Light My Fire” by Jose Feliciano, The Sunshine Company, Jan and Dean and others. The song could be about a game two people are playing who are children or youth or adults. The question and statement in the lyrics, “can you see me?/I can see you,” suggest that the age of the two persons involved is on the younger end of the spectrum. Not that some adults might not engage in this kind of banter. But the songs’ melody and instrumentation are suggestive of childlike innocence and playfulness. In 1967, Jackie DeShannon appeared in a college-themed film titled C’mon, Let’s Live A Little. She co-starred with Eddie Hodges and Bobby Vee. In 1969, she had her biggest hit, “Put A Little Love In Your Heart”, which climbed to #4 on the Billboard Hot 100. After the sixties, DeShannon turned to songwriting for other recording artists. He biggest success was with “Bette Davis Eyes”, a #1 song recorded by Kim Carnes in 1981. Between 1963 and 2000, she recorded twenty-one studio albums and was featured on two soundtrack albums. Marc Myers, Put a Little House in Your Heart: After touring with the Beatles, Jackie DeShannon became a hit pop-rock songwriter in L.A., Wall Street Journal, December 12, 2013. Sharon Lee Myers, Only 13, Is Talented Batavia Vocalist”, Batavia Herald, Batavia, Illinois, May 5, 1955, p. 1. Peter Lerner, Sweet Sherry: The Early Recording Career of Jackie DeShannon, Spectropop.com. Bill Sachs, Folk, Talent & Tunes, Billboard, June 10, 1957, p. 61.